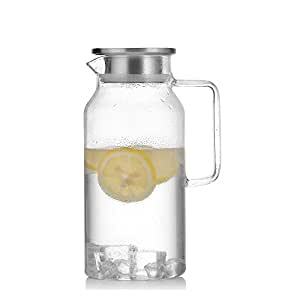 Lead-fee Borosilicate pitcher with Stainless Steel Lid,This mouth blowing carafe withstands temperature 0 ℉ to 300 ℉,so you can pour boiling water into it safely, even if take it out of the fridge straight away. Enough to serve your family or entertain your guests,Fits well in most fridges,you can use it for juices, iced tea, hot tea and so many more types of drinks from water. It has a great capacity, an elegant design, crystal clear high quality glass and amazing bonus gifts, and the inner lid with a section of 2.5mm-slits filter makes perfect tea or fruit infusion. If you're not completely satisfied simply let us know and we will offer a prompt refund or replacement,you just keep the product has no used with waterlike. I like this glass pitcher which is with high quality glass, and the design is contemporary, easy to clean and very nice-looking, you can also put very hot water which will not break the glass either. How can you drink hot beverages in these glass cups without a handle?